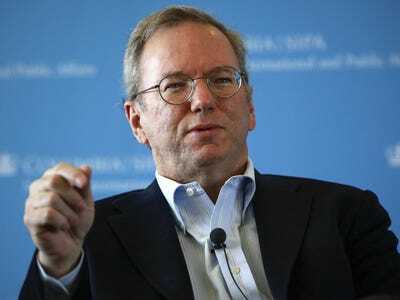 REUTERS/Shannon StapletonGoogle Executive Chairman Eric Schmidt speaks on his book ‘How Google Works’ at Columbia University in New York, October 30, 2014. The European Union is planning its most aggressive move yet to curb Google’s growing power. According to the FT, the European parliament is considering a motion that would suggest Google unbundle its search engine from its other products. Google executives are said to be “furious” about the proposal, which they only found out about a couple days ago. The parliament doesn’t have the power to do this on its own, but could pressure antitrust regulators, who have been investigating Google for more than three years now. The concern is that Google uses its search dominance to squeeze out search results that would guide people to potential competitors. Google and the EU were said to be reaching a deal earlier this year, but Microsoft and some other competitors argued against it, and the EU reopened its investigation in September. The European parliament will agree on final language for the proposal next week and is expected to vote on it next Thursday.